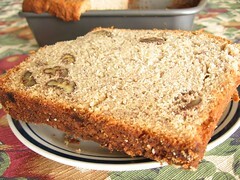 Banana Buckwheat Bread - Do You Know The Muffin Man? Notes: This makes an enormous bread, larger than most loaf pans; mine rose an inch and a half above the lip of the tin. Good thing I anticipated this and baked it over a tray. The recipe calls for 2 cups of mashed bananas and one cup of buckwheat flour, so this is a good way to use up those ingredients. The texture is very crumbly, with a light banana flavour. An interesting variation, but it doesn't surpass my favourite. Update (2008-10-20): I recently made this replacing the shortening with an equal weight of lard, using a 12-cup muffin tin and an 8×4" loaf pan. It worked quite nicely.